Pasadena High School (PHS) is a public high school in Pasadena, California. It is one of four high schools in the Pasadena Unified School District. The school was first established as a district school in 1884 and became Pasadena High School in 1891. In 1928, the school merged into Pasadena Junior College and operated as a four-year school, grades 11, 12, 13 and 14. Pasadena realigned its 6-4-4 school system in 1954 with Pasadena High School regaining its separate identity. 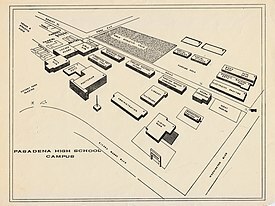 PHS, however, shared the Pasadena City College Colorado Boulevard campus through the graduating class of 1960 when PHS moved to its present campus on Sierra Madre Boulevard at Washington Boulevard. The Rose Parade, post parade Showcase of Floats takes place in front of the high school utilizing some of the school grounds and parking lots. Pasadena High School's athletic field was renovated, adding light towers, a new track and replacing the grass field with artificial turf. It opened at the start of the 2009-10 school year. The school's junior varsity and varsity football teams as well as the boys' and girls' soccer teams play their home games. The school also is used for its track meets in the spring. On January 8, 2019, Pasadena High School opened the renovated Tom Hamilton Gymnasium at the cost of $19 million dollars. It is used for boys and girls junior varsity and varsity basketball teams and the girls volleyball team for their home games. The school's auditorium is named after Gladiss Edwards, who was the principal during the late 1950's and into the 1960's. In 2013, Pasadena High School's student population consisted of 2,028 students, with 56% of students being Latino, 20% white, 16% African-American, and 5% Asian and Pacific Islander. Pasadena High School offers several special unique programs. The Graphic Communications Academy was established in partnership with the Printing Industry of Southern California and Pasadena City College. The Visual Arts and Design Academy is linked with the Art Center College of Design, Pasadena City College and the Pasadena Art Armory. The Center for Independent Study program is a remedial program to help students who are behind in credits. PHS also offers a career pathway called the App Academy, which helps students learn about web design. Pasadena High School competes against John Muir High School at the Rose Bowl in a football game known as the Turkey Tussle. The tradition began in 1947, and Muir leads the series 42-18-2. Pasadena High School also has a NNDCC unit, which is a non-funded version of the US Navy's NJROTC program. Pasadena High School has had a Reserves Officer's Training Corps since 1920 starting as Army but has also been Air Force and Marines as well in the past. They disbanded in 2017-2018 academic year. See also: Category:Pasadena High School (California) alumni. Charley Paddock, two-time Olympic champion, "fastest man in the world"
Kevin Tighe, 1962, actor Emergency! ^ a b "2003-2004 School Accountability Report Card" (PDF). Pasadena Unified School District. Archived from the original (PDF) on 2007-09-27. ^ a b c d "Search for Public Schools - School Detail for Pasadena High". National Center for Education Statistics. Institute of Education Sciences. Retrieved January 17, 2019. ^ "Pasadena High School (CA) Home | MaxPreps". maxpreps.com. CBS Interactive. Retrieved January 17, 2019. ^ "The Turkey Tussle". Pasadena High School Official Website. Archived from the original on 2011-07-27. Retrieved 2007-12-09. ^ "Orientation to High School" (PDF). PUSD. Retrieved 25 April 2016. ^ Site, Cardinal Fang's Python. "Carol Cleveland biography". www.cardinalfang.net. Retrieved 2018-06-07. ^ Wright, Rick (10 November 2005). "ABQjournal: From Childhood, Through UNM and the NBA, Michael Cooper Has Persevered". Albuquerque Journal. Retrieved 17 April 2011. ^ Wise, James (2014). At the Helm of USS America: The Aircraft Carrier and Its 23 Commanders, 1965-1996. McFarland. p. 17. ISBN 9780786476565. ^ Holt, Steve (9 December 2010). "Bob Eubanks fullfills [sic] lifelong dream". The Acorn. Retrieved 17 April 2011. ^ McCarthy, Todd. Howard hawks: The Grey Fox of Hollywood. Grove Press. 1997. p. 36. ^ "City of Pasadena: Councilmember Chris Holden (1989–2012)". Retrieved 17 April 2011. ^ Tranquada, Jim. "Occidental College :: Legendary Track Coach Payton Jordan to be Honored at SCIAC Track Championships April 23". Occidental College. Archived from the original on 28 September 2011. Retrieved 17 April 2011. ^ "Oral History Transcript — Dr. Edwin McMillan". American Institute of Physics. June 1, 1972. ^ Hogan, Marvin (July 29, 2008). "Gainesville native called fastest man in the world". Gainesville Daily Register. Retrieved January 4, 2013. ^ Farago, Ladislas. Patton: Ordeal And Triumph. Westholme Publishing. p. 57. ISBN 1-59416-011-2. ^ Jayes, Ella (September 13, 2017). "QUIÑ is Bringing Her Fantasy Soul Dreamland to Life With 'DREAMGIRL'". milk.xyz. Milk Agency LLC. Retrieved 2019-03-04. ^ Jensen, George (March 23, 1964). "Marsh Named Valley's Top Prep Cager". Pasadena Independent. p. 15. Retrieved July 31, 2015 – via Newspapers.com. ^ a b Beyette, Beverly (1988-01-04). "'Franco's Kids' Pay Tribute". Los Angeles Times. Los Angeles, California. After 26 years as drama teacher at Pasadena High, Franco was retiring to devote full time to acting and writing. For three months, his one-time pupils had planned this tribute, a party Saturday night at the Bel-Air home of scriptwriter Cynthia Whitcomb (class of '69). ^ a b "Drummerworld: Alex van halen". Retrieved December 1, 2008.